This Egyptian family adventure visits the Pyramids, Sphinx and the Egyptian Museum in Cairo where the famous Tutankhamun mask is housed. Heading south to Aswan, board a traditional felucca sailing boat towards Luxor where we visit the famous Karnak Temple and explore the underground tombs in the Valley of the Kings. The trip ends on the Red Sea. Arrive in Cairo and check-in at the hotel. Cairo is Africa's second largest capital city and is a vibrant, exhilarating and welcoming city. Home to the best Pharaonic, Coptic and Islamic sites in Egypt, there is an incredible amount to discover here. If you arrive early you may wish to catch your first glimpse of the mighty Nile River, visit the capital's medieval market at Khan el Khalili or walk down the Nile promenade. Alternatively our hotel has a lovely swimming pool so you may just like to relax after your flight. Cairo is situated mainly on the east bank of the Nile. This morning we take a short drive to Giza, to visit one of the seven ancient wonders of the world, the Pyramids, among the most impressive man-made spectacles in the world. Here, you can opt to venture inside one of the main pyramids or take in the Solar Boat Museum, designed to transport the Pharaoh's soul to the afterlife. The complex includes the Sphinx, a crouching lion with a human head carved from solid rock and the splendid Granite Temple. In the afternoon, we move on to the Egyptian Museum, which amongst its 100,000 artefacts contains the extraordinary treasures of Tutankhamun, complete with his Golden Mask. The scale of the exhibit is truly incredible and it is mind boggling to comprehend they were all discovered in his tomb at the Valley of the Kings. There are also two fascinating Mummies Rooms to explore at the museum (extra charge payable). Later this afternoon we will transfer to the station to catch the overnight sleeper train to Aswan. The individual compartments contain a bench seat which converts into bunk beds. The carriage steward sets this up and provides bed linen, blankets and pillows. Each cabin is lockable and has a night light and cupboard that houses a small sink, shelf, mirror, towel and power socket plus there is a removable table top that folds into the wall. Dinner and breakfast are provided by the carriage steward who delivers the meals directly to you. Two western style toilets are located at the end of each carriage and there are is a communal lounge carriage with a bar serving soft drinks. Some cabins have inter connecting doors so families have access to each other. We arrive early morning in Aswan, Egypt's most southerly city, traditionally regarded as the frontier post of Upper Egypt. Sited on the east bank, just below the First Cataract, it is the meeting point of Arab culture with Nubia and Black Africa. Due to our early arrival rooms may not be available immediately so we may take a walk around the town and along the Nile promenade with our Tour Leader, acquainting ourselves with the city. Once at the hotel we have several hours free to relax and enjoy the swimming pool which lies almost directly on the banks of the Nile offering great views of boats and local life. Or you may wish to explore the vibrant local bazaar just a short walk away. Packed full of exotic spices, leather goods and richly decorated crafts it's an ideal place to spend a couple of hours. Alternatively we offer an interesting excursion to the High Dam, Philae Temple and Unfinished Obelisk on this day (please refer to the optional excursion section for details). Later this afternoon we take a boat and sail to the Nubian Village. Here we meet with a family, learn about their lifestyle and enjoy a traditional dinner in their home, a real highlight for parents and children alike. You may like to bring some small gifts for the children in the village such as notebooks and pencils. This evening we return back to our hotel by boat along the Nile. This morning there is the option to drive through the desert to the fabulous rock-hewn temple of Abu Simbel, a major highlight for many who visit Aswan. Cut into the rock face, this enormous structure was raised 61m to save it from being flooded by the artificial lake that was created by the building of the Aswan High Dam. The 20m high statues represent Ramses II, known as the Great Builder and one of the most powerful Pharaohs of the New Kingdom. For those choosing this option we will need to leave early (around 4.30) , returning to Aswan around 13.30. For those not opting to travel to Abu Simbel there is the option of visiting St Simeon's monastery by camel. After breakfast transfer by boat across to the West Bank and meet our camel train, our very own 'ships of the desert' and head out to St Simeon's. One of the largest Coptic monasteries in Egypt, St Simeon's was built in the 7th century and finally abandoned in the 13th century. It now sits in splendid isolation at the end of a desert valley, an impressive sight, looking more like a desert fortress than a place of worship. The camel ride is around 45 minutes long before we reach the monastery. After the visit we remount and ride a similar distance further along the bank to our boat which has repositioned to meet us. On returning to Aswan we board our feluccas straight from the hotel and set sail downstream, travelling through the timeless landscape of the Nile Valley, in the time honoured fashion of the ancient Egyptians themselves. As we sail we see the intensive cultivation of the Nile Valley and at intermittent points there are small villages that depend upon the river for their livelihood. As the golden colours of the late afternoon cast their glow over the land of the Pharaohs we will dock and set up camp beside the river bank. Sleeping on the deck of the feluccas, beneath a blanket of stars, we are rocked to sleep by the gentle waters of the Nile lapping against our boats. This morning we continue our journey slowly down river on our traditional lateen rigged felucca boat, following the fertile green ribbon of the Nile Valley, as it winds through parched desert lands. There is ample time to sit back and enjoy the easy pace watching rural life in front of you. At night we tie up to the riverbank at night and listening to Nubian songs and drums around the campfire. A felucca is a traditional sailboat used in Egypt, the primary mode of transport on the mighty Nile river and unchanged over the centuries. Feluccas rely entirely on the breeze to make their way up the Nile, typically the breeze picks up during the day and tails off at night, making for a relaxing and tranquil way to travel as we watch life unfold along the river banks. Sleeping arrangements are on deck, please note sleeping bags are not provided, you can either bring your own or hire locally for £10 per sleeping bag. During the summer months a sleeping bag may not be needed, consider bringing a sleeping bag liner. The maximum capacity is around 7 or 8 people per felucca plus 2 crew, for bigger groups we use two boats. Toilet facilities: During day it is free style behind a tree; once docked for overnight a toilet tent is set up with a deep hole & toilet seat/chair. Tent is approx two meters high. Toilet paper is provided and burnt prior to leaving the next morning. Day 6 - Drive to Kom Ombo temple. Continue to Luxor on the banks of the Nile. We disembark our felucca after breakfast and transfer by road to the magnificent ruins of the Ptolemaic temple at Kom Ombo. The temple is unique in that it is dedicated to not one, but two gods: Horus, the falcon headed god and Sobek the crocodile god, a useful deity to have on your side given that this stretch of the river was inundated with crocodiles until the early years of the last century! We can use the facilities here before driving on to Luxor, site of the ancient city of Thebes. The drive is approximately 4 hours and we should arrive around mid-afternoon in time to enjoy our hotel pool for a few hours before dinner. 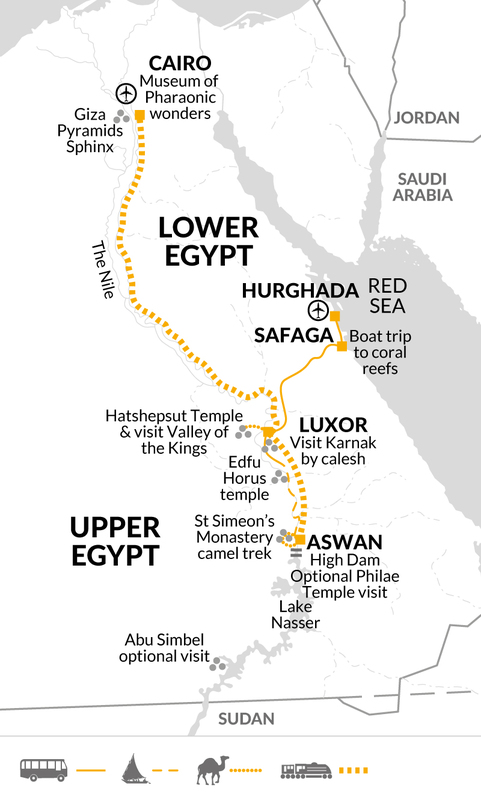 This morning, we cross the Nile and travel by bus to the extraordinary Temple of Queen Hatshepsut, Egypt's only female Pharaoh, who usurped the throne from her son, the future Tuthmoses III. The scale of the temple and its magnificent setting are breathtaking, but perhaps even more remarkable are the details; look out for the fine carving of the 'Expedition to the Land of Punt'. We then take a short bus ride to the Valley of the Kings' to explore some of the more important sites made famous in 1922 by the discovery of the tomb of Tutankhamun by Howard Carter. The tomb entrances are surprisingly large and light, the hieroglyphics an absolute wonder and still so colourful and vivid. We visit three tombs here before returning back across the Nile to our hotel. The afternoon is then free for you to enjoy your time by the pool, enjoy an (optional) donkey trek or wander through Luxor's bazaar. We check out of our hotel and take an early morning excursion to the stunning Temple of Karnak by horse drawn calesh. Dating from around 2000 BC, the scale and grandeur of Karnak is amazing. It covers an area the size of 10 European cathedrals and the 134 pillars of its Hypostyle Hall are a wonder to behold. After our visit here we depart the Nile Valley and head east to the shores of the Red Sea. Crossing the barren mountains of the Eastern Desert we drive to the small town of Safaga, where we will enjoy the delights of a marine wonderland in stark contrast to the desert scenery that surrounds it. There is time to relax and enjoy the dazzling waters immediately outside our hotel. The journey time today is approximately four hours. With over 400 varieties of corals and 1500 species of fish, the Red Sea is a hard act for anyone to follow. There are reef fish of every shade and hue, living amongst the corals, and turtles, rays and small sharks abound in these rich waters. We include a full day's boat trip to the coral reefs around Safaga - it's just like swimming in a tropical fish tank! With a light lunch taken on-board, we will enjoy some leisurely hours swimming, snorkelling or just relaxing, before returning to our hotel for the evening. Tour ends in Safaga after breakfast. For those opting to join the tour earlier and extend your stay in Cairo there are two excursions to consider, Saqqara and Unas Pyramids US$55 per person and a half Day Islamic Cairo tour US$40 per person. There isn't time to fit these in during the tour itself. Day 3: Afternoon excursion by bus and boat to the Philae Temple, Unfinished Obelisk and Aswan High Dam with local guide US$55 per person. Day 4: Camel trek to St. Simeon's Monastery with boat crossings US$40 per person. Please note that all optionals prices are in US Dollars, though local currency or US Dollars will be accepted. There may be a minimum requirement of passengers on certain optional excursions; your Explore leader will be able to advise. Comfortable shoes or trainers for sightseeing and donkey/camel rides; plus sandals. One main piece of luggage and a daysac. During the felucca journey, the main baggage is stowed away beneath deck, but is accessible twice a day. For use on the felucca sailtrek, a 2 season (temperature 0°C to 5°C) sleeping bag is necessary between April and October, 4 season for colder nights between December and February, and a 3 season (temperature -5°C to 0°C) for November and March. It is possible to hire a sleeping bag locally at a cost of £5.00 if you prefer. You should also bring a mosquito net, this can be hung up over your sleeping area. In addition you also require a water bottle, towel, insect repellent and small torch. Mattresses are provided. There are no shower or toilet facilities on board, a toilet tent will be erected on the river bank. You may also want to bring wet wipes. Please note that on the donkey trek and the camel trek we cannot supply hard hats - if head protection is felt to be necessary please bring your own hat. Ear plugs are recommended for the overnight train from Cairo to Aswan. Accordingly, you should allow £25.00 per family member. Cairo: Located on the outskirts of the hectic city of Cairo, the four star Pyramid Park resort hotel is located just ten minutes away from the Great Pyramids of Giza and within walking distance of the new Egyptian Museum opening in late 2018. The hotel features a large reception area with a choice of bars and four restaurants, a modern gym and extensive gardens and terrace area. There is a lovely pool with the hotel rooms located around it. Free Wi fi is available for hotel guests. Luxor: The Isis Cornich hotel is located right on the banks of the Nile River, on the main promenade running through Aswan. This hotel has an excellent swimming pool, ideal for cooling off and relaxing after the train journey from Cairo. All bungalow style rooms overlook the hotel gardens and have air conditioning and cable TV. There is a riverside terrace to have breakfast enjoy a coffee and look out onto the bustling river traffic on the Nile. Complimentary wi-fi is available in the lobby. Aswan: Situated on the East bank of the Nile, the four star Eatabe Luxor Hotel is ideal for families, located in the heart of Luxor with easy access to all the main sights. The hotel has a fantastic swimming pool as well as extensive facilities including an ATM, tennis courts, free wi-fi and large terrace area overlooking the Nile promenade and river beyond. Red Sea, Abu Souma Bay in Safaga. The Lotus Bay resort lies along a sandy beach on the Red Sea and has extensive gardens and a vast swimming pool to relax and soak the sunshine. The hotel boasts a host of water sport activities, snorkelling and extensive health club. Toilet facilities: During day it is free style behind a tree; once docked for overnight a toilet tent is set up with a deep hole & toilet seat/chair. Tent is approx 2m high. Toilet paper is provided & this is burnt prior to leaving the next morning. Sleeping bags: please note sleeping bags are not provided, you can either bring your own or hire locally for £10 per sleeping bag, if you wish to hire a sleeping back please notify us at least 14 days prior to travel. Sleeping arrangements: We sleep on deck. Crew normally sleep inside a small room at the front of the boat. Breakfast: Omlett, OR boiled egg, Jam, Honey, bread, fava beans, tea & biscuits, white feta cheese, fried bread…. Tea and coffee is free during sail, felucca supplies other drinks like Mineral water (small bottles) beer, juice, soft drinks. Honesty tab is set up for these & customer settles their bill later. Big bags with valuable belongings and passport go deep under felucca racks with access to them twice a day, once in the morning just after wake up and once when docking for the night just before sunset. Daily bags with things needed during the day (book, glasses, camera, sun cream, towel ...etc.) are stored close to hand under racks and customers have access to these at all times. Bags are secured and safe during day and night. Capacity - Around 7 people per felucca plus 2 crew. All hotels have pools and we have the chance to swim in the Red Sea. Please ensure you read the FCO advice if anyone in your family is travelling with prescribed medication. Land of the Pharaohs, an Egyptian family adventure. Egypt holds a unique fascination for children. Inspired by learning about the ancient Egyptians in school, the country is purpose built for a family holiday packed full of highlights and only a short flight away from the UK. Experience 6000 years of history including the colossal Pyramids of Giza, the Valley of the Kings and ancient temples that are thousands of years old. 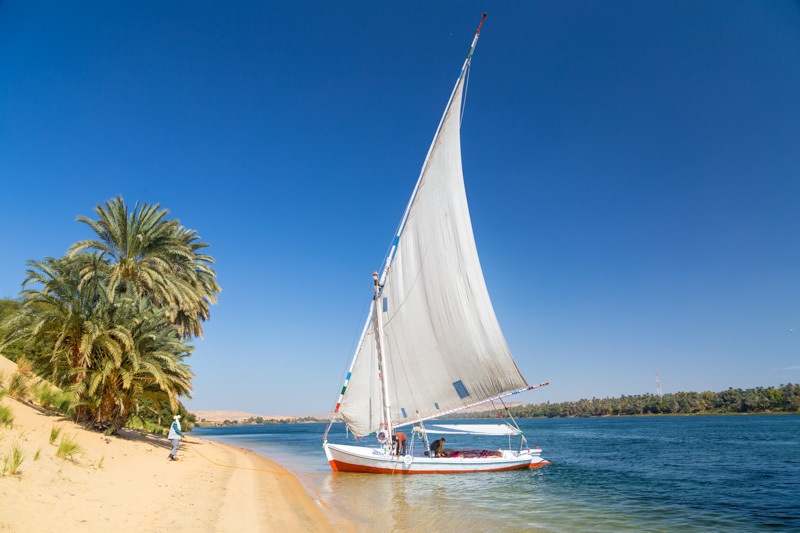 A highlight for many is the cruise down the Nile on a traditional lateen-rigged felucca boat. Sit back on board and watch the countryside slip by, when darkness descends our crew prepare a traditional meal and campfire on the banks of the Nile before we drift off to sleep on deck under the stars. Triple Rooms: This trip allows the option for triple rooms to be included within the booking on all nights of this trip except the felucca and overnight train. If you would like this option, please ask our Sales team for further information. Average Age: As a guide we have identified the actual average age of the children who have travelled on this trip over the last 5 years, to help you decide whether it's the right one for your family. The average age on this trip is 11 years old; this trip is suitable for children of all ages, including younger children. 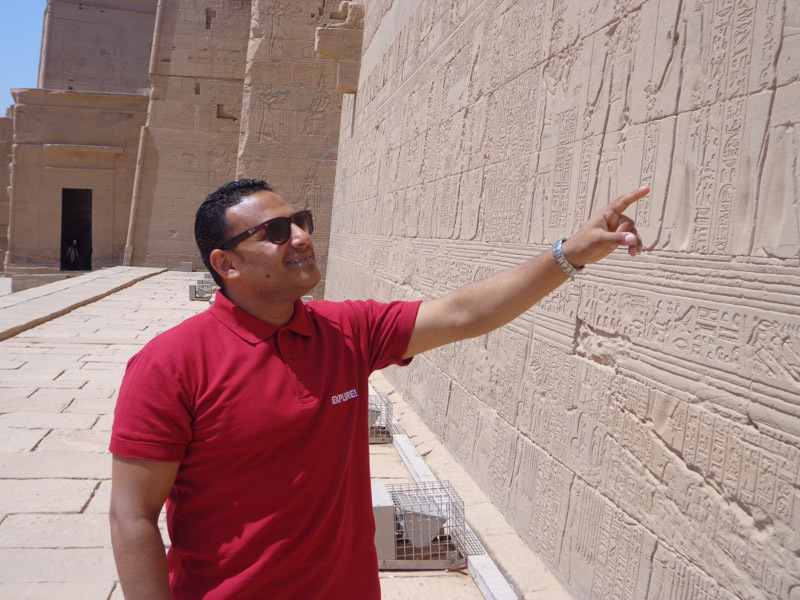 The adventure brings what the kids have learnt about Egypt at school to life with visits to the Pyramids, Sphinx and the Egyptian Museum where the famous Tutankhamun mask is housed. A great trip of discovery, this holiday is perfect for families who want to spend time on a traditional felucca sailing boat, be given the opportunity to snorkel in the Red Sea and discover ancient times and impressive monuments.